As you may have heard over the weekend, two teams from the Big East conference filed applications to join the ACC. They were almost immediately accepted, which shocked many loyal fans, who have grown up watching both Syracuse (one of the Big East charter schools) and Pitt (a main stay and powerhouse for the Big East), get up and move on to bigger and better things in the world of college sports. Many are questioning this move, especially since the Big East is one of the best basketball conferences in the country. The Big East has been a football cream puff for such a long time now that, in order to compete with the growing competition, recruiting, and talent base, both Syracuse & Pitt felt that now was the time to switch Conferences. How bad is the Big East in Football? In the last 4 years, just one school from the Big East has won a BCS bowl game: West Virginia in 2007, when they beat up on Oklahoma 48-28. The departure of big named programs like Virginia Tech, Miami & Boston College, who all left the Big East for the ACC in 2004/2005, contributed to what continues to be the downfall of the Big East by weakening interests from the BCS in the Big East as a major football conference. This turned the already powerful ACC into one of the most formidable football conferences in the country, as they now could add on a conference championship, and compete against the SEC, BIG XII & Pac-12 conferences. That move did nothing for ACC basketball because neither of the three schools ever had strong hoops programs (except for BC when in they won the Big East in 2001 with an overall record of 27-5). Now, with the addition of Syracuse and Pitt, The ACC gains two of the best college programs in the country. More competition: For each school, this will force the Orange and Pitt to go out and find top recruiting prospects in order for them to compete against the likes of Virginia Tech, Florida State, Miami, Maryland, etc. Renewal of old Big East rivalries: Yes as I mentioned before Miami, VT & BC were all members of the Big East at some point, and boy did they have some big time games back in the day. I personally hated Miami and VT so whenever Syracuse played them it was always a big game for us. Great basketball programs in the ACC: As I said before, Another big thing about the ACC is that they have two of the best college basketball programs in the country in Duke University (Coach K) and the University of North Carolina (Coach Roy Williams). When you add Syracuse (Coach Boehiem) and Pitt (Coach Jamie Dixion) into the mix, it will become the most amazing basketball conference in the country. I personally cannot wait to watch “Cuse” go into North Carolina and wail on the Blue Devils for 40 minutes, as I hate them with a passion. Get ready Duke and UNCbecause we’re going to paint Chapel Hill Orange! YEAHHHH BUDDY!! Losing the tradition: With Syracuse and Pitt moving to the ACC, there will no longer be those traditional games in both Football and Basketball. I really do hope they can find a way to keep playing some of the opponents that both teams have played for the past 20 years. Pitt, for example, had an amazing rivalry with West Virginia in Football (the backyard brawl), as well as with Syracuse too (Battle for the Schwartzwalder trophy). In basketball, Syracuse vs. UCONN, Georgetown and Villanova were always HUGE rivalries that would be terrible to see go away. 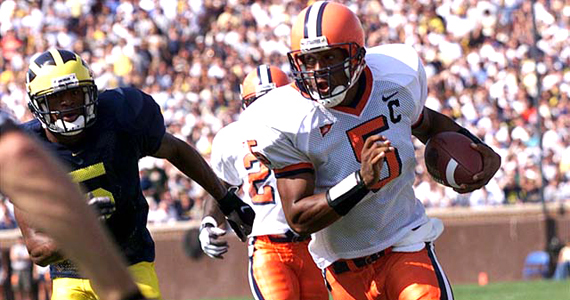 Much tougher competition: Until recently Syracuse spent the 2000s in the gutter of the Big East football under the Greg Robinson Era (shudders). They Only got the scrap in recruiting, which turned the Orange into the Syracuse Clementines. It was not until Coach Doug Marrone came in and began cleaning house that Syracuse finally emerged from gutter and, within two years, got back on the right track (winning their first bowl game in 10 years). It remains uncertain as to how the Orange will finish this year, although they are currently 2-1 and getting ready to start Big East play in a few weeks. The teams in the ACC are tougher. Will Syracuse and Pitt stay afloat in the ACC, or sink to the bottom? My personal take on the whole matter is that I like the change. I like what it does for Syracuse in both Football and Basketball. I embrace the challenge of facing teams like FSU, VT, Maryland, Miami, BC, UNC and Duke, because, in order to prove who has a better athletic program, they have to go where the best chance of winning is. In this case, that is the ACC. The Big East has not done enough in terms of Football, and it has forced some of our best schools to look elsewhere. I understand that this is all about revenue, as football brings in the most money out of any collegiate athletic program, but it is sad that the Big East is going to disband within a few years after it seemed to become such a promising conference when they added TCU in the 2012 season. Now, with Syracuse and Pitt leaving, there is already talk of West Virginia and Louisville looking to join the Big Ten, and UCONN trying to join the ACC as well. So long Big East, you will be missed… but never forgotten.